SACRAMENTO — The Sacramento Police Department is investigating the homicide of 22-year-old Eric Solen Jackson of Sacramento and has made two arrests in the case. The Sacramento Bee reports that Jeremy Daniel McMahon, 31, was arrested on suspicion of homicide, torture with intent to cause cruel and extreme pain, false imprisonment, and possession of a firearm by a felon, and his girlfriend, Michelle Kiyomi Okumura, 23, was arrested on suspicion of torture with intent to cause cruel or extreme pain, and false imprisonment. The District Attorney’s Office has decided to charge Okumura with murder as well. 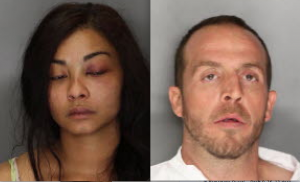 The two were arraigned in Sacramento Superior Court on Thursday. According to the DA’s criminal complaint, McMahon fired the fatal shot with a .45 caliber handgun and Okumura used a “heated metal implement” to torture the victim before he was killed. Okumura also had a handgun but did not fire it, the DA said. On Oct. 8 at 3:04 a.m., police responded to an apartment in the 1700 block of O Street for a report of a disturbance. The caller heard loud bangs, glass breaking and possibly gunshots. Officers arrived at the residence and found three individuals, one of whom had a gunshot wound to the upper body. Officers summoned medical aid for the victim and detained the couple. The Sacramento Fire Department arrived to provide medical aid, but despite life-saving efforts, Jackson succumbed to his injuries and was declared dead at the scene. Initial investigation revealed that the three knew one another, that the apartment belonged to Okumura, and that Okumura and Jackson had a business relationship that had gone sour. Officers canvassed the neighboring units and residences for potential witnesses to the shooting. A gun was recovered and booked into evidence.